Coffee, tea and other naturally caffeinated drinks are usually not considered energy drinks. Other soft drinks such as cola may contain caffeine, but are not considered energy drinks either. Some alcoholic drinks, such as Buckfast Tonic Wine, contain caffeine and other stimulants. According to the Mayo Clinic, it is safe for the typical healthy adult to consume a total of 400 mg of caffeine a day. This has been confirmed by a panel of the European Food Safety Authority, which also concludes that a caffeine intake of up to 400 mg per day does not raise safety concerns for adults. According to the ESFA this is equivalent to 4 cups of coffee (90 mg each) or 5 standard cans (250 ml) of energy drink (80 mg each). Energy drinks have the effects caffeine and sugar provide, but there is little or no evidence that the wide variety of other ingredients have any effect. Most effects of energy drinks on cognitive performance, such as increased attention and reaction speed, are primarily due to the presence of caffeine. Other studies ascribe those performance improvements to the effects of the combined ingredients. Advertising for energy drinks usually features increased muscle strength and endurance, but there is still no scientific consensus to support these claims. Energy drinks have been associated with health risks, such as an increased rate of injury when usage is combined with alcohol, and excessive or repeated consumption can lead to cardiac and psychiatric conditions. Populations at-risk for complications from energy drink consumption include youth, caffeine-naïve or caffeine-sensitive, pregnant, competitive athletes and people with underlying cardiovascular disease. Energy drinks are marketed to provide the benefits among health effects of caffeine along with benefits from the other ingredients they contain. Health experts agree that energy drinks which contain caffeine do improve alertness. The consumption of alcohol drinks combined with energy drinks is a common occurrence on many college campuses. The alcohol industry has recently been criticized for marketing cohesiveness of alcohol and energy drinks. The combination of the two in college students is correlated to students experiencing alcohol-related consequences, and several health risks. There is no reliable evidence that other ingredients in energy drinks provide further benefits, even though the drinks are frequently advertised in a way that suggests they have unique benefits. The dietary supplements in energy drinks may be purported to provide produce benefits, such as for vitamin B12, but no claims of using supplements to enhance health in otherwise normal people have been verified scientifically. Various marketing organizations such as Red Bull and Monster have described energy drinks by saying their product "gives you wings", is "scientifically formulated", or is a "killer energy brew". Marketing of energy drinks has been particularly directed towards teenagers, with manufacturers sponsoring or advertising at extreme sports events and music concerts, and targeting a youthful audience through social media channels. When mixed with alcohol, either as a prepackaged caffeinated alcoholic drink, a mixed drink, or just a drink consumed alongside alcohol, energy drinks are often consumed in social settings. Energy drinks have the effects caffeine and sugar provide, but there is little or no evidence that the wide variety of other ingredients have any effect. Most of the effects of energy drinks on cognitive performance, such as increased attention and reaction speed, are primarily due to the presence of caffeine. Advertising for energy drinks usually features increased muscle strength and endurance, but there is little evidence to support this in the scientific literature. A caffeine intake of 400 mg per day is considered as safe from the European Food Safety Authority (EFSA). Adverse effects associated with caffeine consumption in amounts greater than 400 mg include nervousness, irritability, sleeplessness, increased urination, abnormal heart rhythms (arrhythmia), and dyspepsia. Consumption also has been known to cause pupil dilation. [medical citation needed] Caffeine dosage is not required to be on the product label for food in the United States, unlike drugs, but most (although not all) place the caffeine content of their drinks on the label anyway, and some advocates are urging the FDA to change this practice. Combined use of caffeine and alcohol may increase the rate of alcohol-related injury. Energy drinks can mask the influence of alcohol, and a person may misinterpret their actual level of intoxication. Since caffeine and alcohol are both diuretics, combined use increases the risk of dehydration, and the mixture of a stimulant (caffeine) and depressant (alcohol) sends contradictory messages to the nervous system and can lead to increased heart rate and palpitations. Although people decide to drink energy drinks with alcohol with the intent of counteracting alcohol intoxication, many others do so to hide the taste of alcohol. However, in the 2015, the EFSA concluded, that “Consumption of other constituents of energy drinks at concentrations commonly present in such beverages would not affect the safety of single doses of caffeine up to 200 mg.” Also the consumption of alcohol, leading to a blood alcohol content of about 0.08%, would, according to the EFSA, not affect the safety of single doses of caffeine up to 200 mg. Up to these levels of intake, caffeine is unlikely to mask the subjective perception of alcohol intoxication. Excessive or repeated consumption of energy drinks can lead to cardiac problems, such as arrhythmias and heart attacks, and psychiatric conditions such as anxiety and phobias. In Europe, energy drinks containing taurine and caffeine have been associated with the deaths of athletes. A 2017 study in the Journal of the American Heart Association noted that caffeine content was not the only factor, and that the cocktail of other ingredients in energy drinks made them more dangerous than drinks whose only stimulant was caffeine; the study noted that more research was needed on the individual ingredients to determine which ones pose a hazard. Research suggests that emergency department (ED) visits are on the increase. In 2005, there were 1,494 emergency department visits related to energy drink consumption in the United States; whereas, in 2011, energy drinks were linked to 20,783 emergency department visits. During this period of increase, male consumers consistently had a higher likelihood of visiting the emergency department over their female counterparts. Research trends also show that emergency department visits are caused mainly by adverse reactions to the drinks. In 2011, there were 14,042 energy drink-related hospital visits. Misuse and abuse of these caffeinated drinks also cause a significant amount of emergency department visits. By 2011, there were 6,090 visits to the ED due to misuse/abuse of the drinks. In many cases 42% of patients had mixed energy drinks with another stimulant, and in the other 58% of cases the energy drink was the only thing that had been consumed. Several studies suggest that energy drinks may be a gateway drug. Energy drinks were an active subset of the early soft drink industry; Pepsi, for instance, was originally marketed as an energy booster. Coca-Cola's name was derived from its two active ingredients, both known stimulants: coca leaves and kola nuts (a source of caffeine). Fresh coca leaves were replaced by "spent" ones in 1904 because of concerns over the use of cocaine in food products; the federal lawsuit United States v. Forty Barrels and Twenty Kegs of Coca-Cola pressured The Coca-Cola Company into reducing the amount of caffeine in its formula by 1916. These developments brought an end to the first wave of energy drinks. In the UK, Lucozade Energy was originally introduced in 1929 as a hospital drink for "aiding the recovery;" in the early 1980s, it was promoted as an energy drink for "replenishing lost energy." One of the first post-Forty Barrels energy drinks introduced in America was Dr. Enuf. Its origins date back to 1949, when a Chicago businessman named William Mark Swartz was urged by coworkers to formulate a soft drink fortified with vitamins as an alternative to sugar sodas full of empty calories. He developed an "energy booster" drink containing B vitamins, caffeine and cane sugar. After placing a notice in a trade magazine seeking a bottler, he formed a partnership with Charles Gordon of Tri-City Beverage to produce and distribute the soda. Dr. Enuf is still being manufactured in Johnson City, Tennessee and sold sparsely throughout the nation. In Japan, the energy drink dates at least as far back as the early 1960s, with the launch of the Lipovitan brand. However, in Japan, most of the products of this kind bear little resemblance to soft drinks, and are sold instead in small brown glass medicine bottles, or cans styled to resemble such containers. These "eiyō dorinku" (literally, "nutritional drinks") are marketed primarily to salarymen. Bacchus-F, a South Korean drink closely modeled after Lipovitan, also appeared in the early 1960s and targets a similar demographic. In 1985, Jolt Cola was introduced in the United States. Its marketing strategy centered on the drink's caffeine content, billing it as a means to promote wakefulness. The drink's initial slogan read: "All the sugar and twice the caffeine." In 1995, PepsiCo launched Josta, the first energy drink introduced by a major US drink company (one that had interests outside energy drinks), but Pepsi discontinued the product in 1999. Pepsi would later return to the energy drink market with the AMP brand. In Europe, energy drinks were pioneered by the Lisa company and a product named "Power Horse", before Dietrich Mateschitz, an Austrian entrepreneur, introduced the Red Bull product, a worldwide bestseller in the 21st century. Mateschitz developed Red Bull based on the Thai drink Krating Daeng, itself based on Lipovitan. Red Bull became the dominant brand in the US after its introduction in 1997, with a market share of approximately 47% in 2005. In New Zealand and Australia, the leading energy drink product in those markets, V, was introduced by Frucor Beverages. The product now represents over 60% of market in New Zealand and Australia. UK supermarkets have launched their own brands of energy drinks, sold at lower prices than the major soft drink manufacturers, that are mostly produced by Canadian beverage maker Cott. Tesco supermarkets sell "Kx" (formerly known as "Kick"), Sainsbury's sell "Blue Bolt" and Asda sell "Blue Charge"—all three drinks are sold in 250-milliliter cans and 1-liter bottles—while Morrison's sell "Source" in 250-milliliter cans. Cott sells a variety of other branded energy drinks to independent retailers in various containers. Since 2002, there has been a growing trend for packaging energy drinks in bigger cans. In many countries, including the US and Canada, there is a limitation on the maximum caffeine per serving in energy drinks, so manufacturers include a greater amount of caffeine by including multiple servings per container. Popular brands such as Red Bull, Hype Energy Drinks and Monster have increased the can size. The energy shot product, an offshoot of the energy drink, was launched in the US with products such as "5-Hour Energy," which was first released onto the market in 2004. A consumer health analyst explained in a March 2014 media article: "Energy shots took off because of energy drinks. If you’re a white collar worker, you’re not necessarily willing to down a big Monster energy drink, but you may drink an energy shot." In 2007, energy drink powders and effervescent tablets were introduced, whereby either can be added to water to create an energy drink. Energy drinks are also popular as drink mixers—Red Bull and vodka is a popular combination. In the US, a product called "Four Loko" formerly mixed beer with caffeine, while Kahlua is a coffee-flavored alcoholic drink. On 14 August 2012, the word "energy drink" was listed for the first time in the Merriam-Webster's Collegiate Dictionary. Energy shots are a specialized kind of energy drink. Whereas most energy drinks are sold in cans or bottles, energy shots are usually sold in smaller 50ml bottles. Energy shots can contain the same total amount of caffeine, vitamins or other functional ingredients as their larger versions, and may be considered concentrated forms of energy drinks. The marketing of energy shots generally focuses on their convenience and availability as a low-calorie "instant" energy drink that can be taken in one swallow (or "shot"), as opposed to energy drinks that encourage users to drink an entire can, which may contain 250 calories or more. Energy drinks such as Red Bull are often used as mixers with alcoholic drinks, producing mixed drinks such as Vodka Red Bull which are similar to but stronger than rum and coke with respect to the amount of caffeine that they contain. Sometimes this is configured as a bomb shot, such as the Jägerbomb or the F-Bomb — Fireball Cinnamon Whisky and Red Bull. Caffeinated alcoholic drinks are also sold in some countries in a wide variety of formulations. The American products Four Loko and Joose originally combined caffeine and alcohol before caffeinated alcoholic drinks were banned in the U.S. in 2010. Several drinks were marketed in the 2000s as "anti-energy", "chill out", or "relaxation" drinks, some of which contained theanine and melatonin. Energy drinks generally contain methylxanthines (including caffeine), B vitamins, carbonated water, and high-fructose corn syrup (for non-diet versions). Other commonly used ingredients are guarana, yerba mate, açaí, and taurine, plus various forms of ginseng, maltodextrin, inositol, carnitine, creatine, glucuronolactone, sucralose and ginkgo biloba. One survey found that various energy drinks had 6–242 milligrams (mg) of caffeine per serving. In comparison, an 8 US fluid ounces (240 ml) cup of coffee contains 100 mg of caffeine and 12 US fluid ounces (350 ml) of Coca-Cola Classic contains 35 mg of caffeine. Consumer Reports expected that the caffeine content of a drink should be within 20% of what the label claims, but product testing on United States energy drinks found that the caffeine levels of some energy drinks vary beyond that range. The Monster Beverage Corporation explained they do not report caffeine levels because "there is no legal or commercial business requirement to do so, and also because our products are completely safe, and the actual numbers are not meaningful to most consumers." Consumer Reports noted that "labels on both tested Monster drinks—like those of 16 other products—warn against use by children, pregnant or nursing women, and people sensitive to caffeine." The survey found that eleven of the twenty seven drinks surveyed did not list caffeine amounts; eleScientific groups and consumer organizations have requested more disclosure in ingredient lists. The sugar in non-diet energy drinks is food energy that can be utilized by the human body. Globally, energy drinks are typically attractive to young people. Approximately 66% of consumers are between the ages of 13 and 35 years, with males being approximately 65% of the market. A 2008 statewide Patient Poll conducted by the Pennsylvania Medical Society's Institute for Good Medicine found that: 20% of respondents aged between 21 and 30 had used energy drinks in high school or college to stay awake longer to study, or to write a paper; and 70% of respondents knew someone who had used an energy drink to stay awake longer to study or work. US research by Packaged Facts in 2012 showed that consumers aged between 18 and 34 years, men, Hispanics, Pacific region residents and adults with children in the household were the demographic groups that were using the highest amounts of energy drinks. Market research firm Euromonitor calculated that the global energy drink market was worth US$3.8 billion in 1999 and this value grew to US$27.5 billion in 2013. In 2000, the US energy drink market was worth US$350 million and data from the Packaged Facts company shows that the industry grew by 60 percent between 2008 and 2012 in the US—by 2012 total US sales were over US$12.5 billion. Red Bull and Monster were the two best-selling brands in 2012, accounting for nearly 80% of US energy drink sales, and the energy shot market is worth over US$1 billion in 2014. The energy drink Red Bull did not get market approval in France after the death of an 18-year-old Irish athlete, Ross Cooney, who died within hours after playing a basketball game and consuming four cans of the product. This ban was challenged in the European Court of Justice in 2004 and consequently lifted. Norway did not allow Red Bull for a time, although this restriction has recently been relaxed. In May 2009 it became legal to sell in Norway. The Norwegian version has reduced levels of vitamin B6. The United Kingdom investigated the drink, but only issued a warning against its consumption by children and pregnant women. In 2009 under the Ministry of Social Protection, Colombia prohibited the sale and commercialization of energy drinks to minors under the age of 14. In November 2012, President Ramzan Kadyrov of Chechnya (Russian Federation) ordered his government to develop a bill banning the sale of energy drinks, arguing that as a form of "intoxicating drug", such drinks were "unacceptable in a Muslim society". Kadyrov cited reports of one death and 530 hospital admissions in 2012 due to "poisoning" from the consumption of such drinks. A similar view was expressed by Gennady Onishchenko, Chief Sanitary Inspector of Russia. In 2009, a school in Hove, England requested that local shops refrain from selling energy drinks to students. Headteacher Malvina Sanders added that "This was a preventative measure, as all research shows that consuming high-energy drinks can have a detrimental impact on the ability of young people to concentrate in class." The school negotiated for their local branch of the Tesco supermarket to display posters asking students not to purchase the products. Similar measures were taken by a school in Oxted, England, which banned students from consuming drinks and sent letters to parents. Some countries have certain restrictions on the sale and manufacture of energy drinks. 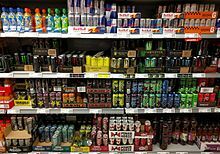 In Australia and New Zealand, energy drinks are regulated under the Australia New Zealand Food Standards Code; limiting the caffeine content of 'formulated caffeinated beverages' (energy drinks) at 320 mg/L (9.46 mg/oz) and soft-drinks at 145 mg/L (4.29 mg/oz). Mandatory caffeine labeling is issued for all food products containing guarana in the country, and Australian energy drink labels warn consumers to drink no more than two cans per day. As of 2013 in the United States some energy drinks, including Monster Energy and Rockstar Energy, were reported to be rebranding their products as drinks rather than as dietary supplements. As drinks they would be relieved of F.D.A. reporting requirements with respect to deaths and injuries and can be purchased with food stamps, but must list ingredients on the can. In November 2014, Lithuania became the first country in the EU to ban the selling of energy drinks to anyone under the age of 18. The Baltic state placed the ban in reaction to research showing how popular energy drinks were among minors. According to the AFP reports roughly 10% of school-aged Lithuanians say they consume energy drinks at least once a week. In June 2016, Latvia banned the sale of energy drinks containing caffeine or stimulants like taurine and guarana to people under the age of 18. In January 2018, many United Kingdom supermarkets banned the sale of energy drinks containing more than 150 mg of caffeine per liter to people under 16 years old. Some places ban the sale of prepackaged caffeinated alcoholic drinks, which can be described as energy drinks containing alcohol. In response to these bans, the marketers can change the formula of their products. ^ Preszler, Buss. "How much is too much?". mayoclinic.org. Mayo Clinic. Archived from the original on 3 November 2014. Retrieved 5 November 2014. ^ Smith, Leesa (3 September 2014). "'My heart just hit the floor': A mother's pain after her son died from drinking FOUR energy drinks daily... as a doctor warns no more than two caffeinated drinks per day". Daily Mail Australia. Archived from the original on 4 September 2014. Retrieved 3 September 2014. ^ a b c "Scientific Opinion on the safety of caffeine". EFSA Journal. 13 (5). May 2015. doi:10.2903/j.efsa.2015.4102. ^ a b McLellan TM, Lieberman HR (2012). "Do energy drinks contain active components other than caffeine?". Nutr Rev. 70 (12): 730–44. doi:10.1111/j.1753-4887.2012.00525.x. PMID 23206286. ^ a b Van Den Eynde F, Van Baelen PC, Portzky M, Audenaert K (2008). "The effects of energy drinks on cognitive performance". Tijdschrift voor Psychiatrie. 50 (5): 273–81. PMID 18470842. ^ a b Mora-Rodriguez R, Pallarés JG (2014). "Performance outcomes and unwanted side effects associated with energy drinks". Nutr Rev. 72 Suppl 1: 108–20. doi:10.1111/nure.12132. PMID 25293550. ^ a b c Reissig CJ, Strain EC, Griffiths RR (2009). "Caffeinated energy drinks—a growing problem". Drug Alcohol Depend. 99 (1–3): 1–10. doi:10.1016/j.drugalcdep.2008.08.001. PMC 2735818. PMID 18809264. ^ a b Sanchis-Gomar F, Pareja-Galeano H, Cervellin G, Lippi G, Earnest CP (2015). "Energy drink overconsumption in adolescents: implications for arrhythmias and other cardiovascular events". Can J Cardiol. 31 (5): 572–5. doi:10.1016/j.cjca.2014.12.019. PMID 25818530. ^ a b Petit A, Karila L, Lejoyeux M (2015). "[Abuse of energy drinks: does it pose a risk?]". Presse Med. 44 (3): 261–70. doi:10.1016/j.lpm.2014.07.029. PMID 25622514. ^ Higgins, John; Yarlagadda, Santi; Yang, Benjamin; Higgins, John P.; Yarlagadda, Santi; Yang, Benjamin (June 2015). "Cardiovascular Complications of Energy Drinks". Beverages. 1 (2): 104–126. doi:10.3390/beverages1020104. ^ a b c d e f g Meier, Barry (1 January 2013). "Energy Drinks Promise Edge, but Experts Say Proof Is Scant". The New York Times. New York: NYTC. ISSN 0362-4331. Archived from the original on 12 April 2015. Retrieved 26 September 2014. ^ a b O'Brien, Mary Claire; McCoy, Thomas P.; Rhodes, Scott D.; Wagoner, Ashley; Wolfson, Mark (2008). "Caffeinated Cocktails: Energy Drink Consumption". Academic Emergency Medicine. 15 (5): 453–60. doi:10.1111/j.1553-2712.2008.00085.x. PMID 18439201. ^ EFSA Panel on Dietetic Products, Nutrition and Allergies (2011). "Scientific Opinion on the substantiation of health claims from Energy Drinks". EFSA Journal. 9 (4): 2035 [19 pp.] doi:10.2903/j.efsa.2011.2035. Archived from the original on 19 September 2015. Retrieved 26 September 2014. ^ "Scientific Opinion on the substantiation of health claims". EFSA Journal. 8 (10): 1756. 2010. doi:10.2903/j.efsa.2010.1756. Archived from the original on 13 November 2008. Retrieved 26 September 2014. ^ Plamondon, Laurie (2013). "Energy Drinks: Threatening or Commonplace? An Update" (PDF). TOPO (6): 7. Archived (PDF) from the original on 2 December 2016. Retrieved 1 December 2016. ^ Warning: Energy Drinks Contain Caffeine Archived 7 May 2018 at the Wayback Machine by Allison Aubrey. Morning Edition, National Public Radio, 24 September 2008. ^ a b Pennay A, Lubman DI, Miller P (2011). "Combining energy drinks and alcohol" (PDF). Archived (PDF) from the original on 24 September 2015. Retrieved 12 August 2015. ^ O'Brien MC, McCoy TP, Rhodes SD, Wagoner A, Wolfson M (2008). "Caffeinated cocktails: Energy drink consumption, high-risk drinking, and alcohol-related consequences among college students". Academic Emergency Medicine. 15 (5): 453–60. doi:10.1111/j.1553-2712.2008.00085.x. PMID 18439201. ^ Clauson KA, Shields KM, McQueen CE, Persad N (2008). "Safety issues associated with commercially available energy drinks". J Am Pharm Assoc (2003). 48 (3): e55–63, quiz e64–7. doi:10.1331/JAPhA.2008.07055. PMID 18595815. ^ Emily A. Fletcher; Carolyn S. Lacey; Melenie Aaron; Mark Kolasa; Andrew Occiano; Sachin A. Shah (May 2017). "Randomized Controlled Trial of High‐Volume Energy Drink Versus Caffeine Consumption on ECG and Hemodynamic Parameters". Journal of the American Heart Association. 6 (5): e004448. doi:10.1161/JAHA.116.004448. PMC 5524057. PMID 28446495. ^ a b c d "The DAWN Report: Update on Emergency Department Visits Involving Energy Drinks: A Continuing Public Health Concern". archive.samhsa.gov. Archived from the original on 17 February 2016. Retrieved 12 March 2016. ^ United States Substance Abuse and Mental Health Services Administration (10 January 2013). "Update on Emergency Department Visits Involving Energy Drinks: A Continuing Public Health Concern" (PDF). Archived (PDF) from the original on 30 January 2015. Retrieved 12 August 2015. ^ Fred W. Sauceman (1 March 2009). The Place Setting: Timeless Tastes of the Mountain South, from Bright Hope to Frog Level. Mercer University Press. pp. 89–. ISBN 978-0-88146-140-4. ^ Saxena, Jaya. "How Energy Drinks Through the Ages Have Gotten Humanity JACKED UP". Pictorial. Archived from the original on 28 January 2018. Retrieved 13 September 2018. ^ "PepsiCo to Stop Selling Josta Brand". Los Angeles Times. 26 March 1999. Retrieved 13 September 2018. ^ "Soda With Buzz". Forbes, Kerry A. Dolan. Archived from the original on 2 November 2012. Retrieved 28 March 2005. ^ "Our brands – V". Frucor. Archived from the original on 12 June 2013. Retrieved 24 May 2013. ^ a b "Energy Drinks: Boost in Action Ahead". Food Directions. 25 January 2013. Retrieved 24 October 2018. ^ a b c d Roberto A. Ferdman (26 March 2014). "The American energy drink craze in two highly caffeinated charts". Quartz. Archived from the original on 27 March 2014. Retrieved 27 March 2014. ^ O'Connor, Clare (8 February 2012). "The Mystery Monk Making Billions With 5-Hour Energy". Forbes. Forbes LLC. Archived from the original on 8 February 2015. Retrieved 27 March 2014. ^ "Caffeine Experts at Johns Hopkins Call for Warning Labels for Energy Drinks - 09/24/2008". Archived from the original on 14 September 2018. Retrieved 13 September 2018. ^ "Effervescent tablet - an overview". www.sciencedirect.com. Retrieved 13 September 2018. ^ Italie, Leanne. "F-bomb makes it into mainstream dictionary". The Washington Times. Archived from the original on 15 August 2012. Retrieved 15 August 2012. ^ Miller, Kevin (1 February 2017). "As more 'nips' bottles litter Maine landscape, group calls for 15-cent deposit". Portland Press Herald. Archived from the original on 23 October 2018. Retrieved 23 October 2018. ^ Klineman, Jeffrey (30 April 2008). ""Little competition: energy shots aim for big" profits". Bevnet.com. Archived from the original on 14 November 2012. Retrieved 24 May 2013. ^ Marczinski CA, Fillmore MT, Bardgett ME, Howard MA (2011). "Effects of energy drinks mixed with alcohol on behavioral control: Risks for college students consuming trendy cocktails". Alcoholism: Clinical and Experimental Research. 35 (7): 1282–92. doi:10.1111/j.1530-0277.2011.01464.x. PMC 3117195. PMID 21676002. ^ Hoare, Peter (9 January 2014). "5 Awesome Drinks You Can Make With Fireball Cinnamon Whisky". Food & drinks. MTV. Archived from the original on 14 July 2014. Retrieved 17 June 2014. ^ FDA (3 November 2010). "List of Manufacturers of Caffeinated Alcoholic Beverages". U.S. Food and Drug Administration. Archived from the original on 28 October 2010. Retrieved 11 November 2010. ^ Zezima, Katie (26 October 2010). "A Mix Attractive to Students and Partygoers". The New York Times. Archived from the original on 27 October 2010. Retrieved 11 November 2010. ^ Bruni, Frank (30 October 2010). "Caffeine and Alcohol: Wham! Bam! Boozled". The New York Times. Archived from the original on 11 November 2010. Retrieved 11 November 2010. ^ Eunju Lie (19 July 2011). "Relaxation drinks see energetic growth in U.S." Reuters. Archived from the original on 20 July 2011. Retrieved 20 July 2011. ^ Jennifer Nelson, M.S. ; Katherine Zeratsky (6 March 2010). "Relaxation drinks: Does calm come in a can?". Mayo Clinic. Archived from the original on 25 August 2011. Retrieved 20 July 2011. ^ a b c d e f Consumer Reports (December 2012). "Energy Drinks – Caffeine Levels". consumerreports.org. Archived from the original on 17 September 2014. Retrieved 26 September 2014. ^ Heckman, Melanie A.; Weil, Jorge; De Mejia, Elvira Gonzalez (2010). "Caffeine (1, 3, 7-trimethylxanthine) in Foods: A Comprehensive Review on Consumption, Functionality, Safety, and Regulatory Matters". Journal of Food Science. 75 (3): R77–87. doi:10.1111/j.1750-3841.2010.01561.x. PMID 20492310. ^ Visram, Shelina; Crossley, Stephen J.; Cheetham, Mandy; Lake, Amelia (31 May 2016). "Children and young people's perceptions of energy drinks: A qualitative study". PLoS ONE. 12 (11): e0188668. doi:10.1371/journal.pone.0188668. PMC 5708842. PMID 29190753. ^ Pennsylvania Medical Society (19 September 2008). "Energy Drinks "" Busting Your Health for the Buzz". Newswise. Newswise, Inc. Archived from the original on 20 May 2014. Retrieved 27 March 2014. ^ a b "Energy Drink Trends". ReportLinker. January 2013. Archived from the original on 22 March 2014. Retrieved 27 March 2014. ^ a b "French ban on Red Bull (drink) upheld by European Court". Medicalnewstoday.com. Archived from the original on 5 May 2009. Retrieved 7 May 2009. ^ Red Bull blir tillatt i Norge – NRK Norge – Oversikt over nyheter fra ulike deler av landet Archived 21 September 2015 at the Wayback Machine. Nrk.no (23 April 2009). Retrieved on 2016-11-14. ^ "Kadyrov Vows to Ban Energy Drinks". The Moscow Times. 21 November 2012. Archived from the original on 12 December 2013. Retrieved 24 November 2012. ^ "Pupils facing energy drink 'ban'". BBC News. 7 October 2009. Retrieved 15 October 2009. ^ "Australia New Zealand Food Standards Code – Standard 2.6.4 – Formulated Caffeinated Beverages – F2009C00814". comlaw.gov.au. Department of Health and Ageing (Australia). 13 August 2009. Archived from the original on 13 December 2012. Retrieved 3 November 2012. ^ Pogson, Jenny (9 May 2012). "Energy drinks pack more punch than you might expect". ABC. Archived from the original on 1 September 2014. Retrieved 3 September 2014. ^ Barry Meier (19 March 2013). "In a New Aisle, Energy Drinks Sidestep Some Rules". The New York Times. Archived from the original on 20 March 2013. Retrieved 20 March 2013. ^ "A Country In Europe Bans Energy Drinks For Minors". Business Insider. Archived from the original on 11 September 2018. Retrieved 11 September 2018. ^ Smithers, Rebecca (5 March 2018). "UK supermarkets ban sales of energy drinks to under-16s". The Guardian. Archived from the original on 5 March 2018. Retrieved 5 March 2018. ^ "Four Loko Changing Its Formula". NBC Chicago. Archived from the original on 12 July 2018. Retrieved 12 July 2018. Bagchi, D. (2017). "Chapter 26: Caffeine-Containing Energy Drinks/Shots: Safety, Efficacy and Controversy". Sustained Energy for Enhanced Human Functions and Activity. Elsevier Science. pp. 423–445. ISBN 978-0-12-809332-0. Retrieved 23 October 2018. Wikimedia Commons has media related to Energy drinks. This page was last edited on 22 April 2019, at 01:53 (UTC).